Comparative texts about Pharisees & Sadducees from Josephus, Tosefta, Mishnah & Babylonian Talmud. Comparative texts about Baptism: Water & Spirit from DSS, Josephus, Babylonian Talmud. Comparative primary texts about Purity and Social Relations (see esp "Tax Collectors Visit," from Mishnah, Midrash, Tosefta, and Babylonian Talmud. At Mahlon H. Smith's (Rutgers University) Into His Own: Perspective on the World of Jesus. XXXIII.28-29, 31-32, 35-39; Tatian's Diatessaron (c. 150-160). "They hurry to the kingdom of God and you go slowly, so that you should at least have followed their example. Mark then that this word, "go into", is improperly taken in this place because none of them followed Christ." "Parables which give reproof, speak plainly to the offenders, and judge them out of their own mouths." "The publicans and harlots - The most notorious sinners were reformed, though at first they said, I will not. And ye seeing the amazing change which was wrought in them, though at first ye said, I go, sir, repented not afterward - Were no more convinced than before. O how is this scripture fulfilled at this day!" "The publicans and the harlots were the first son, who, when told to work in the Lord's vineyard, said, I will not; but afterwards repented and went. Their early life was a flat and flagrant refusal to do what they were commanded; it was one continued rebellion against the authority of God. The chief priests and the elders of the people, with whom our Lord was now speaking, were the second son, who said, I go, sir, but went not. They were early called, and all their life long professed obedience to God, but never rendered it; their life was one of continued disobedience." "The Greek word here translated "repent," is not the one which is used in all commands as, "Repent, for the kingdom of heaven is at hand," "Repent and be baptized," "Repent and be converted," etc. This term means, rather, regret or sorrow; the word in the other passages means "change your minds" or "hearts."" Commentary, Matthew 21:23-32, Stanley Saunders, Preaching This Week, WorkingPreacher.org, 2017. "Matthew highlights Jesus’ authority as a central, albeit contested issue throughout the Gospel..."
"True Authority," Karoline Lewis, Dear Working Preacher, 2017. A Provocation, Richard Swanson, 2017. "The Eternal Now," David Lose, ....in the meantime, 2017. "Wording Authority," D. Mark Davis, Left Behind and Loving It, 2017. "When You Don't Have the Numbers...and When You Do," Andrew Prior, First Impressions, 2017. "'The Children's Teeth,'" Janet Hunt, Dancing with the Word, 2017. "Things of God and Things Not," Glenn Monson, Law and Gospel Everywhere, 2017. "The Perils of Power," Jacob E. Pierce, Modern Metanoia, 2017. "Violence of a Peacemaker," Commented Bible Passages from Taize, 2012. Commentary, Matthew 21:23-32, Emerson Powery, Preaching This Week, WorkingPreacher.org, 2014. "Is there something special about the radical nature of those who accept God's will?" "Promising an Open Future," David Lose, Dear Partner in Preaching, 2014. "I don't think the focus of this scene and parable is on us nearly as much as it is on God. God the author of all life who regularly decides to invite a new relationship with us. God who will not count our past deeds, mistakes, griefs, or hurts against us. God who refuses to define us by what we do (or what has been done to us), but instead regards us always and only as God's beloved children." "Authority Issues," Karoline Lewis, Working Preacher, 2014. "When do we reflect responsibly on the authority imparted to us? How do we use our authority? Or misuse it? In what way is our authority perceived?" "Why Work to Change the World?" Matthew L. Skinner, ON Scripture, Odyssey Networks, 2014. Video: Race in America. "It is easy to make pledges when an issue erupts. It can be easy to write a check or to resolve to put our faith into action into particular ways. Following through by working for long-term change is more difficult." "The Two Sons," Suzanne Guthrie, At the Edge of the Enclosure, 2014. "The Will of the Father..." Janet H. Hunt, Dancing with the Word, 2014. "I expect most of us can think of times when we have been like both of the sons in Jesus' parable today. Where have you seen this play out in your experience?" "Which One Are You?" Faith Element, 2014. "Authority Questions," Nancy Rockwell, The Bite in the Apple, 2014. "Jesus speaks instead about the Spirit as Author of his Words. This is a very different kind of authority." "Identified Sinners," Alan Brehm, The Waking Dreamer. "Whenever we use our religion to make ourselves look good at the expense of others, we're really only deceiving ourselves so that we can avoid facing our own sins." "Authority in Word and Deeds," Thomas Beam, 2014. The Parable of the Obedient and Disobedient Sons is echoed in the film In Friendly Persuasion, set in southern Indiana threatened with an invasion by Confederates, in a scene in which one Quaker farmer stoutly says he will stick by his principles of non-violence, and another says he is not sure how he woud act. Ed Mc Nulty, Visual Parables. Evangelio Comentario del San Mateo 21:23-32 por Javier Ortega Badilla, Working Preacher, 2014. Commentary, Matthew 21:23-32, Karl Jacobson, Preaching This Week, WorkingPreacher.org, 2011. "Voltaire quipped that we ought to judge a person by his questions rather than his answers." Discussion about Authority, audio telling, story in episodes, graphic, audio and written commentaries. Go Tell Communications, Biblical Storytelling for the Global Village, 2011. Holy Textures, Understanding the Bible in its own time and in ours, Matthew 21:23-32, David Ewart, 2011. "It is we who are sitting in church who SAY (and sing and pray) many things. But this text puts the focus on what we actually DO. Just exactly what is it that we do after we leave church on Sunday? Ouch." "No Answer," Fr. Rick Morley, a garden path, 2011. "Who Gives Us the Authority?" Carol Howard Merritt, The Hardest Question, 2011. "The question of power echoes throughout history." Comentario del Evangelio por Osvaldo Vena, San Mateo 21:23-32, Working Preacher, 2011. "I'm wondering if it is God who comes and does things that threaten and shatter our understandings of God; and that it is the demonic who wants us to maintain the status quo about God -- which will normally be too narrow an understanding of the God whose ways are far beyond our own." Commentary, Matthew 21:23-32, Ira Brent Driggers, Preaching This Week, WorkingPreacher.org, 2008. "First Thoughts on Year A Gospel Passages in the Lectionary," Pentecost 16, William Loader, Murdoch University, Uniting Church in Australia. "It is odd that we still find so many people inside the church who have a greater problem moving with compassion for change in society than many outside the church. They seem bent on protecting God." Dylan's Lectionary Blog, Proper 21. Biblical Scholar Sarah Dylan Breuer looks at readings for the coming Sunday in the lectionary of the Episcopal Church. "God is calling us to give up our judge's seats. Our edicts never saved anyone anyway (nor did they doom anyone either, though we may have told ourselves and others otherwise). Instead, God invites us to enjoy the freedom for which his people were made..."
"Two Sons: Yeses That Don't Mean a Darn Thing!" Gospel Analysis, Sermons from Seattle, Pastor Edward F. Markquart, Grace Lutheran Church, Seattle, Washington. Detailed background and exegesis. "The parable for today about the Two Sons in the Vineyard needs to be seen in its context with the deepening conflict with the Pharisees." "Matthew 21:28-32, Pentecost 19," Perspectives on the Parables -- Glimpses on the Kingdom of God, Robert H. Albers, Word & World: Theology for Christian Ministry, Luther Northwestern Theological School, 1984. Wellspring of the Gospel, Ordinary 26A, Catherine McElhinney and Kathryn Turner, Weekly Wellsprings. "True Change," Larry Broding's Word-Sunday.Com: A Catholic Resource for This Sunday's Gospel. Adult Study, Children's Story, Family Activity, Support Materials. "How difficult is true moral change?" "The Authority of Jesus," Rev. Bryan Findlayson, Lectionary Bible Studies and Sermons, Pumpkin Cottage Ministry Resources. Includes detailed textual notes. "Which Son Obeyed his Father? The Textual Problem in Matthew 21:29-31," Daniel B. Wallace, Dallas Theological Seminary. "Thus, when one looks at the internal coherence of the story, it seems evident that the Western reading flattens out the mystery and presents the Pharisees as not only unrighteous but blithering idiots. But such a lack of subtlety was probably not a part of the story or the historical situation. And the third reading improves the textat first glancebut in reality seems to unravel the rich tapestry that is being woven by the Master Teacher himself." Grindal, Gracia, "Says Who?" The Christian Century, 2002. Lovette, Roger, "Showing Up," The Christian Century, 2005. Smillie, Gene R., "Jesus' Response to the Question of His Authority in Matthew 21," Bibliotheca Sacra, 2005. Doing Right Because It Is Right -- sermon for Proper 21 | OT 26 based on Matthew 21:23-32 by Richard Gribble from SermonStudio. "Two Sons: Yeses That Don't Mean a Darn Thing!" Sermons from Seattle, Pastor Edward F. Markquart, Grace Lutheran Church, Seattle, Washington. "Side Comments to the Church Crowd," 19 Pentecost - 25 September 2005, David Zersen, Göttinger Predigten im Internet: Every Sunday Sermons based on the RCL by a team of Lutheran theologians/ pastors. The Two Sons -- Children's sermon based on Matthew 21:23-32 by Elaine M. Ward from SermonStudio. "Riddle Me This," Charles Kirkpatrick, Sermons4kids.com. "The Parable of the Two Sons," children's study, puzzles, coloring sheet, etc. Higher Praise Christian Center. "The Prostitutes Shall Be First," from A Certain Jesus by Jose Ignacio and Maria Lopez Vigil. Ideal for catechetical and liturgical dramatization of today's gospel. Claretian Publications. "The Man with Two Daughters," Michael English, Milton Parish Church Drama Resources. Clip Art, Matthew 21:31, Fr. Richard Lonsdale, Resources for Catholic Educators. Clip Art Images: Matthew 21:28-32, Misioneros Del Sagrado Corazón en el Perú. 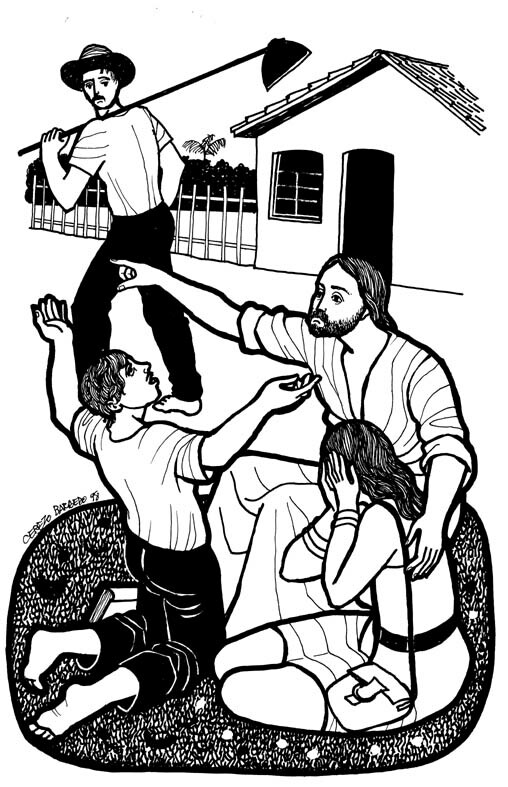 Matthew 21:23-32, at Cerezo Barredo's weekly gospel illustration. Liberation emphasis. “Once a Father Told His Children ,” an original hymn by Carolyn Winfrey Gillette, 2011. This hymn celebrates Jesus' parable of the two sons in Matthew 21:23-32. Tune: NETTLETON 8.7.8.7 D (“Come, Thou Fount of Every Blessing”). A Simple Plan (1998) - which of these two sons did the will of the Father?